yard debris, and recycling services. In order to best suit your needs, Sunset Garbage Collection, Inc. is pleased to provide garbage, yard debris and recycling pickup services for all our residential customers in the Multnomah and Clackamas County areas. 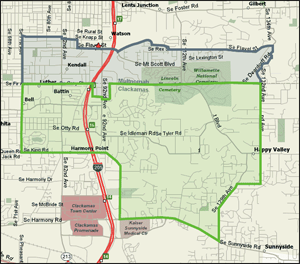 Sunset Garbage Collection is pleased to serve designated residential areas in	Multnomah County and Clackamas County. Below is an Interactive Map that shows	you the regions we serve. Simply click on your area to get detailed information on our residential services, including how our residential recycling program works,	what items can and cannot be recycled, how to prepare items, instructions, carts, etc.